McGowan Institute for Regenerative Medicine Director William Wagner, PhD, Professor of Surgery, Bioengineering and Chemical Engineering at the University of Pittsburgh, Chairman of the Tissue Engineering and Regenerative Medicine International Society (TERMIS) – Americas, Deputy Director of the NSF Engineering Research Center on Revolutionizing Metallic Biomaterials, and Chief Scientific Officer of the Armed Forces Institute of Regenerative Medicine, was a member of the keynote panel of the recently held RAPID + TCT, North America’s preeminent event for discovery, innovation, and networking in 3D manufacturing. 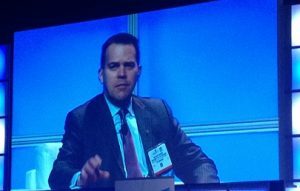 Dr. Wagner served on the Panel: Medical 3D Printing Applications—Growth Beyond Surgical Guides. With anatomical models and surgical guides closer to standards of care, and device manufacturers taking advantage of the unique structures additive manufacturing can build, new applications are growing in the biomaterials area. Dr. Wagner and the other panelists discussed some of these applications, the developments making them possible, the similarities and differences between 3D printing with biomaterials and bioprinting, and expectations for impacting patient care. RAPID + TCT is an additive manufacturing event that showcases product innovations and offers collaborative learning opportunities to ultimately accelerate the adoption and advancement of the technology. The two industry leaders in 3D technology events, SME and Rapid News Publications Ltd., combined their nearly 30 years of insights and experience to produce the annual RAPID + TCT event starting in 2017 in Pittsburgh, Pennsylvania.